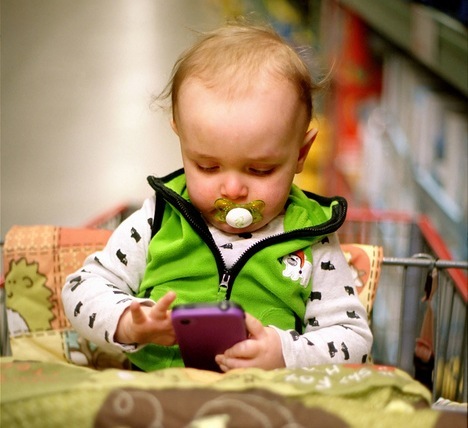 Stop me if you’ve heard this one: 2014 is definitely going to be the year of mobile. Marketers, bloggers, and business analysts alike have been predicting the so-called “year of mobile” at least since 2009, if not before. It’s sort of funny to look back at the multiple posts for each year. Unfortunately, no one really seems to be in agreement as to why a particular year will be – or is, or was – the definitive year of mobile, which is why posts about the subject spring up every few weeks. Business owners and marketing managers have been holding their breath for months now, waiting for exactly the right moment to invest in responsive design or a mobile website, but all the conflicting reports make it difficult to know if the time is right. Pull the trigger too early and it’s money ill-spent; do it too late and you’re lagging behind the competition. Is it already too late? Maybe 2015 will be the year…? To be honest, I don’t think we really need to declare a year of mobile. No one’s ever going to agree on what constitutes the year of anything (remember the “year of video”? Same deal). Instead, we should embrace the fact that we are already living in the age of mobile. Desktop usage is dropping while smartphone ownership is steadily increasing, and this is still just the beginning. 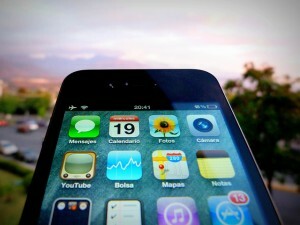 Forget all about the year of mobile and start embracing the new mobile age. Now is the time to take action on mobile advertising, responsive design, and apps. Here’s why. 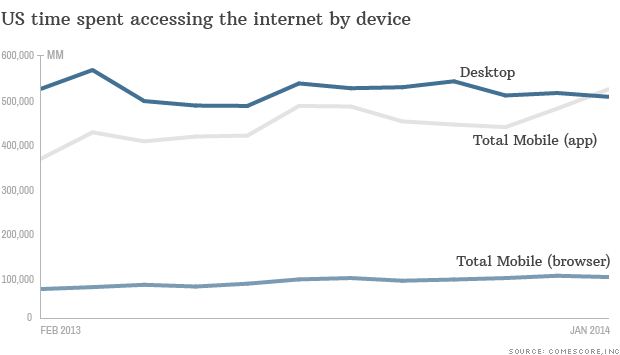 In January, for the first time ever, Americans used mobile apps to access the Internet more than desktops and laptops. According to a comScore report, 55% of all traffic came from mobile devices, either from apps (including Chrome, Firefox, and so on) or built-in browsers. Considering how many of us now rely on the Internet for work, this is a pretty shocking statistic. It means that our day-to-day desktop traffic no longer beats out nighttime and weekend cell phone and tablet traffic. It represents a huge shift in user experience, too: a few years ago, you couldn’t have paid me to shop from my phone, but now that my favorite sites are optimized for mobile, I do it all the time. Also, keep in mind that only 58% of Americans have smartphones. Around 79% have computers. So mobile traffic beat out desktop, even though 20% fewer own smartphones. A few years ago, I remember paying $15 a month for 200 MB of mobile data. As of 2014, unlimited data starts at $35 on Virgin Mobile, or $100 a month for a family of four on T-Mobile. Even as some providers ditch their unlimited plans in favor of mass data sharing or “framily” plans (gotta love those Sprint commercials! ), the cost of mobile bandwidth is dropping, and it’s dropping fast. Competition has created a weird sort of arms race to provide mobile data to families at the cheapest price, and the consumer desire for faster, cheaper, more reliable mobile browsing is helping as well. For the first time ever, it costs less to get online from your cell phone as many times as you want in a month as it does to have a meal for two at a nice restaurant. Internet access is increasingly being seen as a right, not a privilege, and this just proves it. 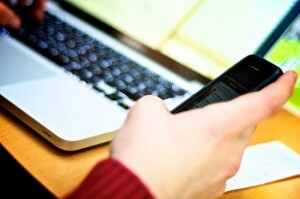 Just last week, Facebook announced that 60% of their advertising purchases now come from mobile devices. Twitter’s Promoted Tweets have showed on mobile since 2012, but will now be able to promote app downloads. And as of last year, Google still brought in 58% of worldwide mobile ad revenue. While the ROI on mobile advertising is debatable, not to mention rarely publicly reported (at least, as of yet), these continuous increases show that businesses are incredibly invested in advertising on mobile. With the increase in time spent on smartphones and tablets, it makes sense that there would be an increase in ads served there. But at least for Google and Facebook, these numbers are over 50%, showing a clear shift away from desktop. People aren’t distinguishing what they’re doing on different screens, so advertisers should be more agnostic about where they reach the user. The fundamental tenet is not to speak about mobile, mobile, mobile. It’s really about living with the users. What device are you on? What’s your question? How can we assist you? That’s a much broader and richer set of activities for us. Remember how, just a little while back, Google switched up the “visits” and “visitors” language in Analytics? This is because they’re trying to combine app and web data. As Nikesh said, Google wants you to focus on user experience and assistance – not the device they’re on. As you’re probably aware, if Google says “jump,” webmasters ask “how high?” So if Google says “serve everyone,” they mean “serve everyone” – and that means providing a consistent experience across all devices. If you own or regularly work on a website (or are about to build one), now is the time to invest in mobile. Based on these recent studies, statistics, and trends, mobile Internet access just keeps going up, and it’s not going to go away anytime soon. If your site isn’t responsive or mobile-friendly, or you don’t have a mobile app, you’re going to start losing traffic. If it’s not happening yet, it’s only a matter of time. To truly embrace the new age of mobile, your website needs to keep up with the standards and expectations of the consumers that visit it. As we move toward the halfway mark of 2014, let’s all forget about trying to agree what constitutes the real “year of mobile.” Instead, as Google suggested, let’s renew our focus on providing a great experience for our customers, visitors, readers, and leads – no matter what device they use to reach us.